Around the KnittyBlog, Thursdays are for obsessing. There are four of us here, and each of us have our own obsessions. And they change, so this could be the most interesting-weird day of the week. Today, I’m obsessing about online beauty shopping. I saw a link on a post by one of my favorite bloggers and it sent me off to investigate. Jane Brocket has excellent color sense.Â So when she recommends a list of colors, I look. In this case, it’s nail polish made by a company [from California?] called butter LONDON. I know, silliness. But their colors are awesome and the names even moreso. The shimmery blue is called big smoke. The purple is called HRH. All their products are free of the big bad three: toluene, formaldehyde and no DBP. This is a good thing. There are lots of other products on the website, none of which caught my eye. I just like color.Â It’s not cheap, but for $14 a bottle, you can make your toes happy. I am excited about the two new Knitty surprises however i can not find the 2-ply silk needed for the Fluidity tank. the yarn website sells 4-ply. what am I doing wrong? I think the one labelled 4-ply IS the right yarn for Fluidity. I’ve written the shop and we’ll get it clarified. Stand by! 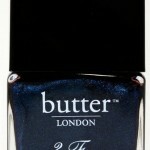 I love Butter London! I’ve got one of the holiday colors on my toes right now. Chip free and long lasting along with being a great line of colors! Nail polish used to be an obsession of mine. I had more than 60 different colors. In the land of things that make you feel happy, $14 isn’t really that much to spend and nail polish lasts a really long time (much longer than a flourless chocolate cake). Travel Knitting; WIPs on a Plane!